Full Selenium IDE Software Review - All You Need to Know About Selenium IDE | Skyose - All-In-One Platform For Guides, Tips and many more. Selenium IDE is a simple integrated development environment. As technology evolves, so does our work process. Not only are we interested in merely recording, editing, and debugging tests, programmers now focus on optimizing the test process through automation. That may be the reason 82 percent of developers are sticking with IDEs rather than using a lightweight editor. More importantly, that’s the reason for this detailed review of Selenium IDE software. 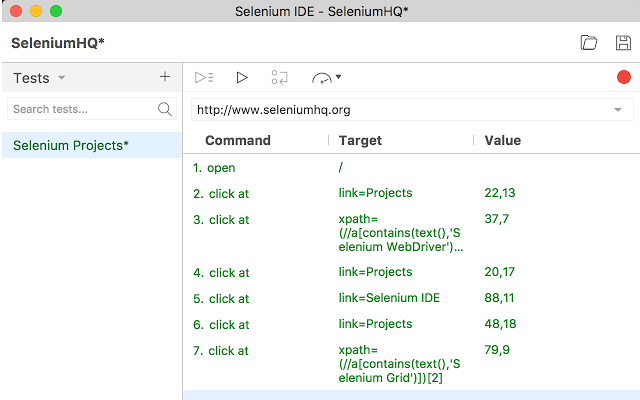 What is Selenium IDE Software? Selenium IDE is a user-friendly integrated development environment designed to record, edit and debug tests. Initially implemented as a Firefox extension, this tool is now available on Google’s Chrome browser and may be the most efficient way to develop test cases. Selenium IDE is a recording tool that allows programmers to capture their actions in the browser or website automatically. This tool allows not only the generation and development of test cases but the maintenance as well. In the end, you would be saving time and learning Selenium script syntax in one fell swoop. Besides, this IDE software enables programmers to set breakpoints as well as start points when trying to find and fix errors in test cases. 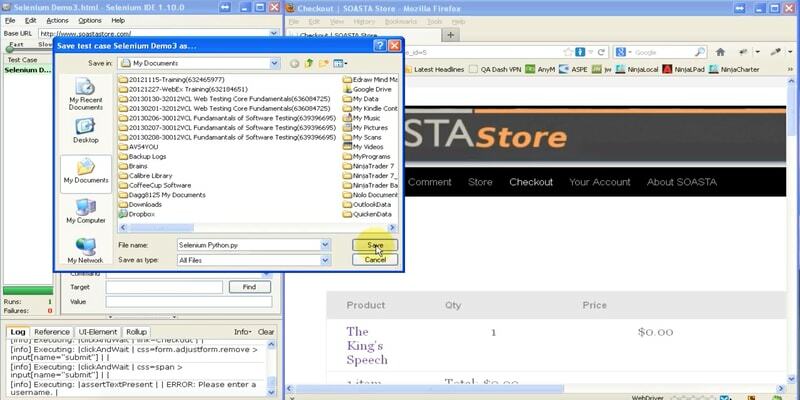 But, perhaps the most impressive part of this software is the option to export and save tests in various formats. Options include HTML and Ruby Scripts. Now that you understand the basics let’s delve a little deeper. 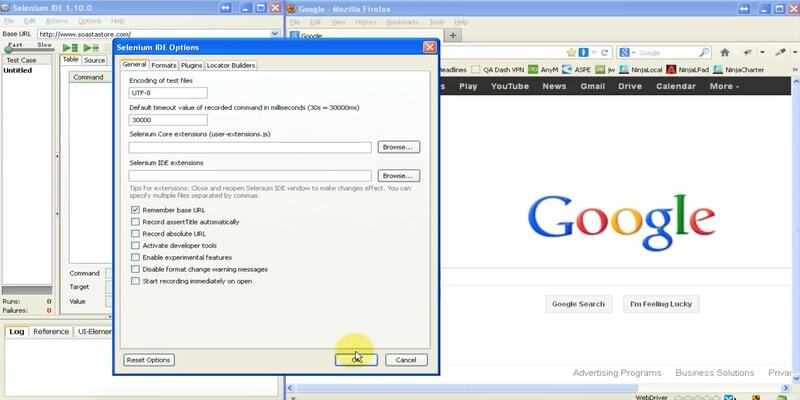 First, download the IDE software using either Chrome or Firefox browsers. Depending on your chosen browser, click “Add to Chrome” or “Add to Firefox.” And when the installation is complete, you’ll see a button on the right-hand side of your address bar. Click on the button to run the Integrated Development Environment. The Test Case Panel displays your script. With the Command, Target, and Value field, you can see the currently selected command as well as its parameters. These are entry fields to adjust the command. Here is how it works. When you specify the first parameter for a command in the reference tab at the bottom pane, it goes directly into the Target Field. Then, a second parameter goes into the Value Field. With the Command Field, you can describe the current command in plain English or other preferred human languages. 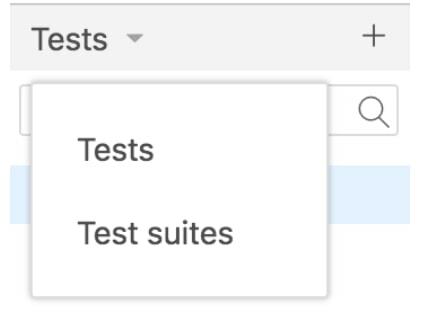 At the right-hand side of the Selenium IDE, you’ll find an option that allows you to navigate between Test uses and Test Suites. When you click on the “Tests” option, a window pops up to offer an alternate option. Also, you can save your projects in the new .side format. Since it combines Test cases and Test Suites, this format is ideal for saving your projects. Due to its similarity with web DevTools, the bottom pane of Selenium IDE is called the Console Panel. Depending on which tab you select, the panel offers a wide range of utility functions. Let’s break the tabs down further, shall we? So far, we have painted a somewhat positive picture of Selenium IDE. However, it would be unobjective to ignore the downsides of this software. So, while summarising the positive aspects, we’ll also explore the limitations of Selenium IDE. Since it’s a browser add-on, setting up Selenium IDE is fast and easy. The whole process will only take about 10 minutes of your time. You don’t have to be a professor of Computer Science or a skilled programmer to set up most tests in Selenium IDE. The truth is, the IDE is mainly pointing and click in function. Aside from the long list of possible assets to use for the debugging, the software also gives a red indication whenever the test fails. Ultimately, Selenium IDE works for an average web user with a basic knowledge of testing. Since it’s an open source project, Selenium IDE has no upfront cost. Not only is it free, but support is also free too. That said, the support is community-based. Now, that you know the strengths, let’s explore the weaknesses, shall we? Outlined below are some disadvantages of Selenium IDE software. Here is the thing; Selenium IDE is an open source project. Although this has come with a couple of advantages, there are some downsides too. The major one is a lack of conformity to a standard. For example, there is a considerable variation between the list of commands and the syntax. While some use the command field and a target, others don’t. They prefer to have the target listed in the value field. However, there are a few that want you to either add or remove specific fields. Now, you may argue that it’s versatility and that’s a good thing. But, there’s just one thing. Since there are no standards, testers must spend a lot of time learning different commands, including what to expect to avoid complications. As simple as this IDE tool is, poor adherence to a standard may ruin it. According to a user, when you use the software for complex testing, you may get false positives 25 percent of the time. And it didn’t do better with the simple tests either. The user claimed to experience flake out 5 percent of the time. Even after spending hours trying to optimize the IDE tool for the best performance, the best it could do was about a 10 percent fail rate. Outlined below are the characteristics of Selenium Integrated Development Environment. 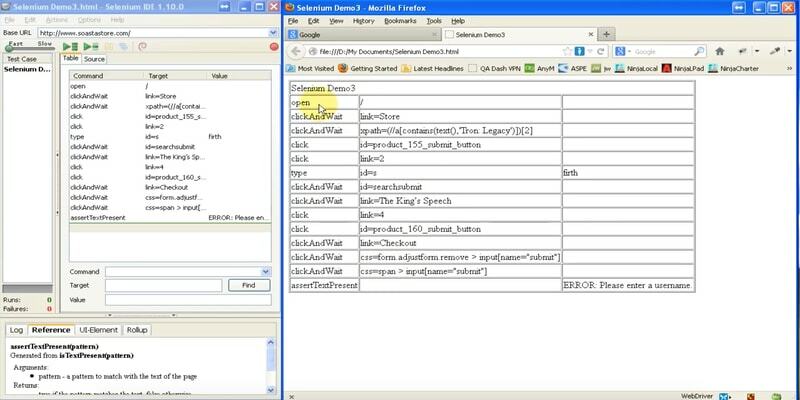 Selenium IDE allows you to record test cases based on interactions with a website automatically. 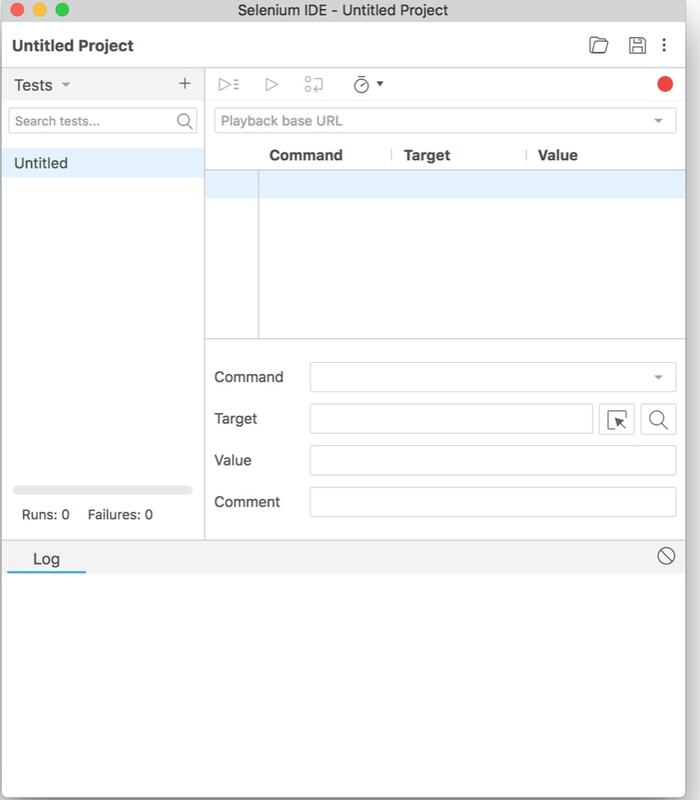 Depending on the action the test developer performs, this IDE tool automatically inserts commands into the test case during the recording process. From clicking a link to clicking radio buttons, each action gets recorded. Be that as it may, developers can disable the automatic recording feature if they choose. Using Selenium IDE to build test cases involves two basic things; adding asserts to test cases as well as verifying commands. Testers use these commands to check the properties of web pages. Here is how it works. When you right click on a text box on the webpage or any other UI element, the context menu pops up. Aside from the pre-defined parameters that depend on the content of the text box, you’ll also see a list of assert and verify commands. And as the developer keeps using the IDE tool, this list of commands will continue expanding. As a result, Selenium IDE software can predict the possible commands, including the parameters for specific UI elements on web pages. With Selenium IDE, programmers will have access to different options. Aside from the ability to pause or resume a test case, they can also run all the test cases within a currently loaded test suite. Furthermore, Selenium IDE users can run a test case from a specific command at the middle, or even prevent it from running on a specified command. What if you’re not sure if the command you created is correct? Selenium IDE offers the option of running a single command for such a scenario. With Selenium IDE, programmers can set breakpoints when debugging their tests. As we said earlier, the IDE tool allows users to start and stop a test cause with a specific command. Let us explain each of these. Programmers use the Action command to manipulate the state of an application. Varying from selecting an option to clicking on a link, Actions can take different forms. In some cases, they return as an error. When this happens, the IDE tool stops the execution of the test you run at that moment. On the other hand, developers use the Accessor command to assess the state of an application. With Selenium Assertions, users can verify if the state of an application conforms to expectations. For example, you can check off the checkbox is checked, or if an application is on the correct page. Since Selenium IDE is an open-source automated testing tool for web applications, you don’t have to pay any enterprise pricing fees. It is completely free. Outlined below are the technical details for the technical information for Selenium IDE Software. Aside from being web-based, you can use this software on Windows, Linux, and Mac Operating Systems. Selenium IDE software is only available in the English Language. This IDE software is ideal for small and medium businesses as well as large enterprises and freelancers. Selenium IDE is deployed as a cloud-hosted software or through Open API. Selenium’s official user group is the first place to ask for help. Chances are, someone has already experienced the challenge you had with the software and reached a solution. That said, remember to search the group first to be sure someone has not answered your question in previous discussions. Although the user group may be the best place to sell support, the chat room helps with solutions that are very important or too simple. Selenium is a diverse project. As such, it is not surprising that many commercial services have sprouted up to support it. Selenium IDE software offers a lot of benefits to its users. Aside from the easy setup and user-friendly interface, the tool itself is easy to use. As such, you don’t need to be a rocket scientist to figure it out. Also, it offers testers the flexibility of inserting commands, setting breakpoints, and writing comments when necessary. But, the strongest point of this software comes from being an open source project. So, not only is this tool free, but you don’t have to pay for support too. Selenium IDE tool’s strongest point may be its biggest weakness too. Since it’s an open source project, the IDE software lacks any form of standardization. As a result, there is a considerable variation between the list of commands and syntax. Unfortunately, this issue is will become more evident as the list of commands increases.